Your #1 Commercial Pole Tent Manufacturer! Purchase a premium tent manufactured by Miami Missionary Tent Company. All of our square & rectangle pole tents are manufactured with first quality vinyl. Our round & oval pole tents are manufactured with custom vinyl made only for Miami Missionary Tent in Miami. The strength of construction is unmatched. Triple stitched seat belted seams from top to bottom insures your tent is ready for extreme weather. Our longest lived tent is our 18 oz premium tent that are round & oval. They are designed to stand up to 3 times longer than industry standard. These premium tents are used most often for ministries around the world for permanent or long term use. Many of our commercial customers purchase them for storage tents and a variety of other uses. Some like these round & oval premium tents not only for their strength, but also their beauty. They are often used for weddings, parties, special events and all kinds of tent meetings. Although we keep a large variety of square & rectangle party tents and round & oval tents in stock, the 18 oz premium tents are normally built custom upon order to best suit what our customers want in tent size and color. Miami Missionary Tent started manufacturing tents in 1980. We have manufactured and shipped tents to 146 countries around the world. When we started, no one was interested in building a heavy-duty, long lived premium tent. A party tent is popular choice for wedding events, trade fairs and other outdoor events where 50 or more people gather together. This type of tent is more costly than traditional canopies used in the backyard and it usually requires a few extra people to set up. Party tents are harder to set up than regular canopy tents. That’s why sometimes they are rented instead of being purchased. 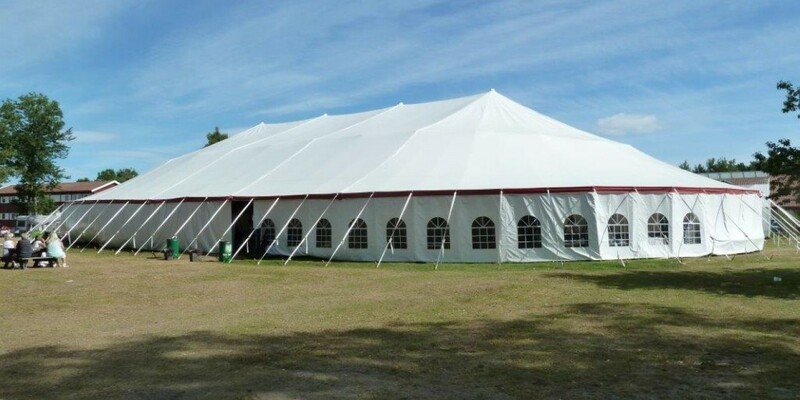 The majority of tent rental companies that offer these tents for lease also offer services for “pitching” and “striking” the tent. If you need a party tent for your event you will need to first consider the area where the tent will be erected. Companies that provide tent rental services commonly charge additional fees if the venue is not exactly the best location to set up a tent. For example, a concrete surface will be more difficult to set up on than grass. The distance of the event from the rental company is also important to consider because typically the greater the distance the greater the cost. Weddings are a more common event that would use party tents. Since weddings don’t happen frequently, most people would prefer to rent a tent rather than purchase one. When tents are used for something more frequent than the occasional event or wedding, people are more inclined to consider party tents for sale instead of renting one. Tents for weddings come in various designs and colors, although white is by far the most common choice. Tent manufacturers who offer wedding tents often provide accessories such as carpet, flooring, platforms, tent designs, awnings and even lighting. The type of tent that will be used for a party needs to be chosen with the weather in mind. If the party will be held during the summer, tents without sidewall are the most common. These party tents for summertime parties are normally set up with only the tent top and the necessary center and wall poles. These type of tents are called pole tents. Pole tents became very popular in the United States back in the 1950’s for use as tents for church planting and revival meetings. Pole tents became extremely popular back in those days due to their classic look and ease of set up. Frame tents are types of party tents for events and parties. Frame tents do not use center or wall poles. Instead, the tent is supported with a framed assembly and anchored with stakes and secured with guy ropes on the outer perimeter. This allows the center to be completely free so that people can move without a center pole obscuring their view or keeping them from dancing at the center. We hope you’ve enjoyed this post. If you still have questions and need assistance, please do not hesitate to give our tent experts a call today at 918.540.2435. One of our knowledgeable and friendly staff members will be happy to assist you. Thanks for reading! Why Miami Commercial Pole Tents…? Miami Missionary Tent Company Inc.